I read last year that a number of states in the USA will no longer be teaching cursive handwriting. Indeed, I have seen examples posted on the internet of students’ handwriting and it is printing – the letters are not joined. The local International School has a paper-free policy whereby all text will be stored and generated on electronic devices. I guess this does not apply to the art department! I received the letter below today in the post (another dying institution?). It’s from my uncle in the UK who will turn 90 this year. I visited him last year and he is indeed looking old but his mind is sharp and his handwriting exquisite although I admit I find some of it a bit difficult to decipher. It is certainly better than my writing and the grand irony of that is I won the Headmaster’s Prize for Handwriting in my final year at junior school. Now I have difficulty reading it myself! I do hope that I will be as lucid as my uncle if I get to 90 even if my handwriting has long since deteriorated below his standard. 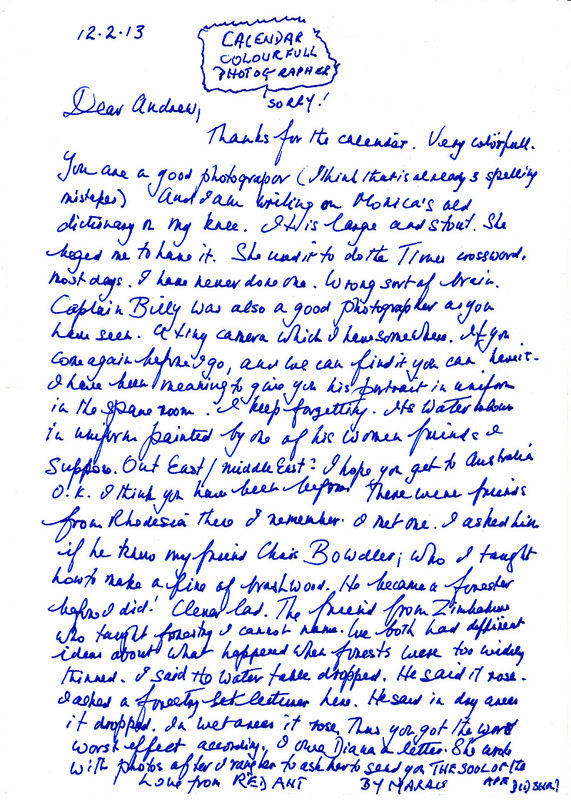 Cursive writing from a 90-year-old! Pleased to see your uncles letter and glad he is still using my mothers dictionary. Thank you! Looking forward to my letter…!